At Beyond Media Solutions, we believe that only hard work pays off. That’s why we’re ready to go an extra mile to assure our clients dominate their local market. We place clients’ businesses in front of their target audience by creating engaging and result-oriented campaigns which have a proven track record of success and amazing business results in the digital marketing realms. In other words, we focus on what motivates clients’ audience and then execute detailed solutions that benefit businesses long-term. Our work ethic and unique approach are the core traits of Beyond Media Solutions. These traits have earned us a stellar reputation and led to our selection as one of the best SEO companies in Los Angeles per SEO Tribunal. SEO Tribunal’s goal is to bring accurate and unbiased reviews of SEO companies; thus, helping companies find their ideal agency which will bring their marketing ideas to live. What makes SEO Tribunal unique is that they don’t use a baseless algorithm to determine the ranking position of the companies reviewed. Instead, they employ a specific evaluation methodology that assesses the qualitative and quantitative traits of the SEO agencies. Being recognized as one of the top SEO companies in Los Angeles highlights our dedication and commitment, giving us reason to continue to evolve as a company and create winning websites. 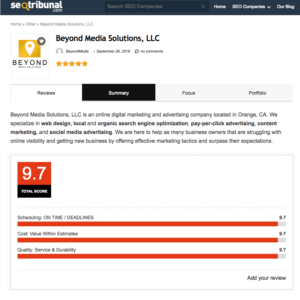 We would love to hear your experience with our firm – go to SEO Tribunal and leave a review. Feel free to also add some opinions on how we can get better in the future.